Description Photo yellowing. Gift of Minnie Aline. 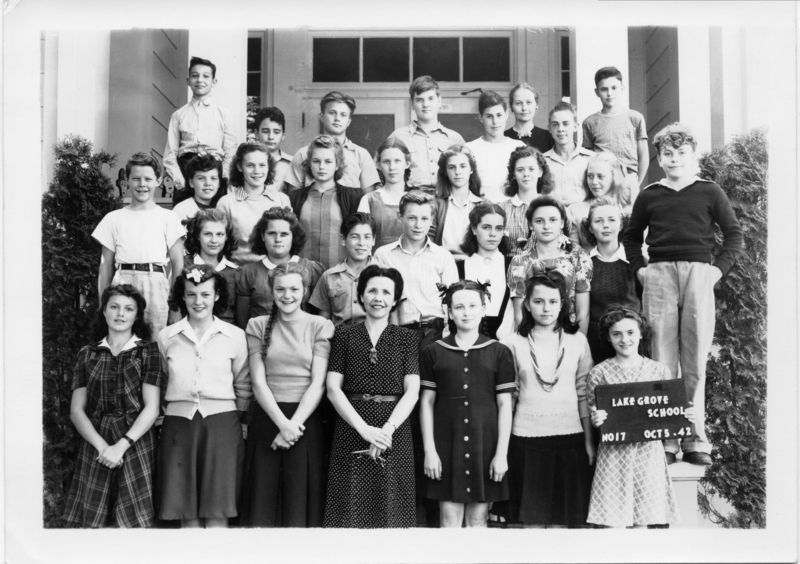 Eighth Grade class, Oct. 1942. Mrs. Emma Genung, teacher. Row 1, left to right: Eleanor Sovey, Yvonne McCauley, Zoe Tweedy, Mrs. Bishop, principal, Minnie Jean MacLennan, Joanne Williams, ?. Row 2, left to right: James Carrol?, ?, ?, Jack Taylor, ?, Marian Morris, ?, Shirley Gibbs, Trieve Tanner. Row 3, left to right: ?, Virginia Worthington, Suzanne Emmons, Bessie Gray, Georgeanne Thien, Barbara Ness, ?. Row 4, left to right: Jimmie Promitas, Evan Hall, George Kruse, Michael Hoggan, Edward Erickson, Mrs. Genung, Calvin Watson, Bill Gerber.